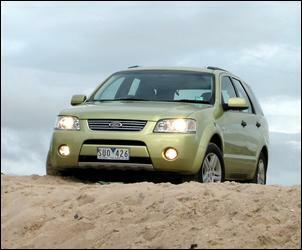 Ford Australia is on a winner with its Territory AWD. If you want a vehicle with the versatility to transport up to seven people in comfort, tackle rough terrain and perform well in urban conditions, well, this is what you’re looking for. The Territory covers all ground very well - and that’s the way Ford intended it. The Territory shares its engine, transmission and IRS design with the everyday BA Falcon but this is fundamentally a new vehicle from the ground-up. It’s much more than an ‘adaptation’ of an existing vehicle – and it shows. Step aboard and the Territory’s relatively high roofline is immediately noticeable. The high roof gives the cabin an airy feel as well as ample headroom in all seating positions. Our test vehicle – the top-line Territory Ghia AWD – came with the optional fold-out third row seat, which gives a total carrying capacity of seven people. This seat, which Ford says is aimed primarily at children and teenagers, is unveiled by two simple steps that are performed from the rear cargo area. Legroom for the second and third row passengers can be altered by sliding the split second row fore-aft. Note, however, third row passengers need to adopt a knees-up position due to the relatively high floor at the rear of the vehicle. 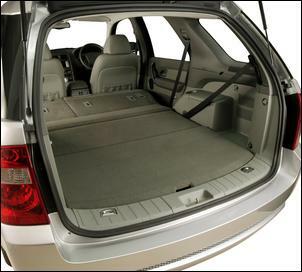 Rear cargo space - with the third row seat folded away - is massive. 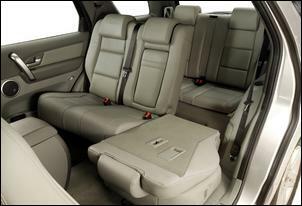 If the need arises, the second row seat is easily tumbled forward and folded flat with the rest of the cargo floor. Note that there’s no need to remove the headrests but they must be slid down. Rear cargo can be accessed by lifting either the tailgate glass or the entire tailgate – there are two push-buttons concealed beneath a chrome exterior panel. Note that a full size space is secured to the underside of the cargo floor. All manufacturers claim their cross-over vehicles drive like a sedan or wagon and, in the case of the Territory, it’s largely true. 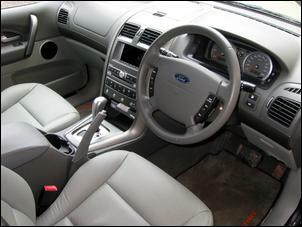 The power-assisted steering, transmission and engine have a familiar feel and the ride is very car-like. It isn’t quite as smooth as an everyday Falcon because of the greater unsprung mass of the bigger wheels, tyres and suspension but it is always very comfortable. It doesn’t matter if you’re bounding over speed humps or driving over large rocks, there’s always plenty of suspension travel and compliance. The Territory’s front suspension is completely new while the rear uses a thoroughly revised version of Ford’s existing Control Blade IRS. The new front suspension (dubbed “Virtual Pivot Control Link”) uses short long arms (SLAs) with double lower ball-joints. The double lower ball-joints are used to create a four-link arrangement. The steering rack is also mounted forward to accommodate the AWD’s equal-length front axles. Ford’s Control Blade IRS was initially designed with the Territory in mind – take a look under the Territory and its rear suspension architecture is similar to a Falcon. 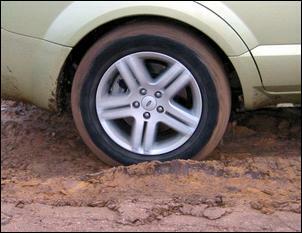 However, suitable changes are made to springs, dampers, wheel track and bushes. The Territory AWD is the first Australian-built vehicle to employ an electronic stability control system - and it’s to enhance safety rather than to sharpen its on-road handling. 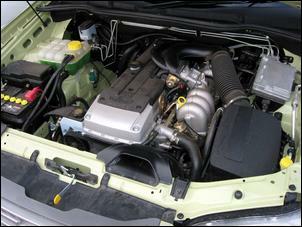 The system brakes individual wheels in addition to controlling engine output. 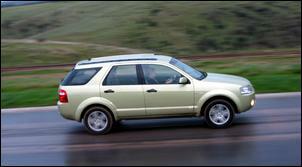 On the road, the Territory exhibits mild understeer when pushed through tight corners. Interestingly, the Territory AWD’s tyres are a unique Goodyear Fortera pattern, which achieves low road noise and a high level grip on a variety of surfaces. Tyresize is 235/60 17. Braking performance was well up to standard during our road test. With 322 x 28 front and 322 x 26mm discs front and rear, the Territory has suitably larger brakes than a basic Falcon. ABS and EBD control systems are fitted as standard. Employing the Falcon’s 182kW/380Nm 4.0 litre DOHC six under the bonnet, the Territory is an adequate performer – but its 2100kg kerb mass is apparent. In urban conditions, the Territory lacks throttle sharpness (perhaps the result of a deliberate electronic throttle control strategy) and is happiest above 3500 rpm. On the open road, there are no problems overtaking but the auto trans is reluctant to come out of top gear - the engine labours to haul the Territory up gradual rises. And that brings us to the driveline. The Territory is currently available only as an automatic. The 4-speed Sequential Sports Shift trannie is always smooth when left in Drive but it suffers from its tendency to stay in top gear. For enthusiastic driving, the sequential shift mechanism works as wel as you’ll find in a BA Falcon. Interestingly, the AWD Territory comes with a transmission fluid cooler and is rated to tow up to 2300kg. But in the real world, we imagine the Territory’s 182kW engine would struggle to lug a fully-loaded cabin cruiser or a large trailer. 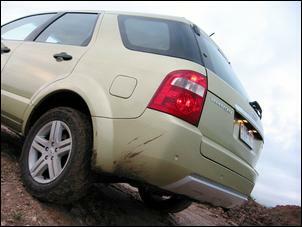 The Territory can be specified in either rear-wheel-drive or all-wheel-drive guise (the latter as tested here). 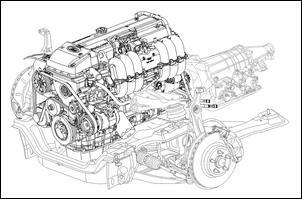 The constant AWD system employs an open centre diff and a static 38:62 front-to-rear torque split. Note that there’s no central slip-limiting device such as a viscous coupling – it’s a similar traction-controlled approach to the Holden Adventra. With total traction but a substantial 2100kg kerb mass, the Territory AWD Ghia accelerates from standstill to 100 km/h in around 10 seconds. As you’d expect, that’s significantly slower than Holden’s V8-powered Adventra, but it’s decent nonetheless. Fuel consumption is better than the Holden V8 rival – but it’s still miserable in absolute terms. We recorded 17.5 litres per 100km during our test, which involved mainly urban driving. Thankfully, the 9.7:1 4.0 litre six is happy to drink normal unleaded which is both relatively cheap and widely available. For optimum performance, high octane unleaded should be used. 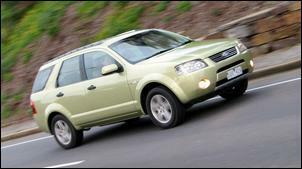 The Territory’s 75 litre fuel tank gives a barely adequate touring range. We won’t give you the wrong impression and suggest the Territory is a go-anywhere machine. If you want real off-road abilities you should be looking at something like a Toyota LandCruiser – a vehicle with at minimum a lockable centre diff. That said, the Territory will suit the needs of most buyers who want to venture off the bitumen for family holidays. Its 178mm ground clearance, 23 degree maximum approach and 20 degree maximum departure angles compare closely to Holden’s Adventra. The widened track also lets you follow in the wheel ruts left by the ‘big boys’ in their LandCruisers. An optional hill descent control system lets you maintain a slow, safe speed when descending steep hills. We tested the Territory AWD Ghia on sand and mud and can vouch that it is very capable – so long as it’s driven mindful that the tyres aren’t optimised for either surface. A gentle-as-she-goes approach is best. And the Ghia-spec Territory lets you plough through the mud in exceptional luxury. Ghias are equipped with standard leather trim, dual zone climate control, cruise control, auto headlights, electro-chromatic interior mirror, trip computer and a power driver’s seat base with memory – note that the backrest and lumbar support are manually adjusted. The Premium 6-disc sound system – coupled with the colour Command Centre display - is also clear and punchy. There’s plenty of storage, cup holders and power outlets scattered throughout the cabin. 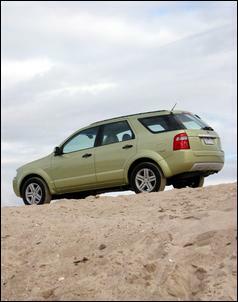 An optional DVD-based navigation system was also fitted to our test vehicle. This was fast at calculating routes but is awkward to use via the remote control. This is the only feature that isn’t well integrated. Safety features include dual front airbags, side curtain airbags, electrically adjustable pedals and extensive safety cell development. The Territory’s high driving position is another major safety plus. Parking is aided by the Ghia’s rear bumper proximity sensors, which beep through the sound system. These beeps maintain a certain volume above the sound settings – a nice touch. At 1676mm tall, the Territory towers above Holden’s Adventra. This is a big vehicle and Ford has styled it with suitably chunky proportions. Note that the body is a claimed 40 percent stiffer than the BA Falcon. The Ghia is distinguished from other Territory models with full colour-coding, fog lights and standard 17 x 7.5 inch 5-spoke alloys. Our week with the Territory AWD Ghia absolutely breezed past – and that’s a sure sign that it’s a comfortable, hassle-free machine. Any buyers tossing up between a people moving van, 4WD and wagon should make sure they check out the new Ford before committing any cash. At AUD$53,290 it undercuts the top-line Holden Adventra (V8) by a substantial AUD$7700 and stacks up well against everything else in the category. Add the third row seat (at AUD$1500) and a few other extra-cost options and it still stands proud. Ford’s effort has certainly paid off.